Who would ever dare say that candy bark is only meant for Christmastime? Ah, I certainly wouldn’t! Valentine’s Day is the perfect season to gift a homemade treat to your loved ones, or even a delightful opportunity to create memories with them that will surely last a lifetime! And what better way to spend this upcoming Valentine’s Day than by preparing some easy to make Valentine’s Day Candy Bark! This recipe allows you to spend more time decorating than preparing, which is easily the best part of baking in my book! I find the best time I have whilst baking is throughout the entire decorating process. Picking the colours for the icing, personalizing your piece, sprinkling with endless amounts of sprinkles. It’s a nod to creativity and a tasty reward at the end. Not to mention licking the icing off the spoon! Mmmmm! 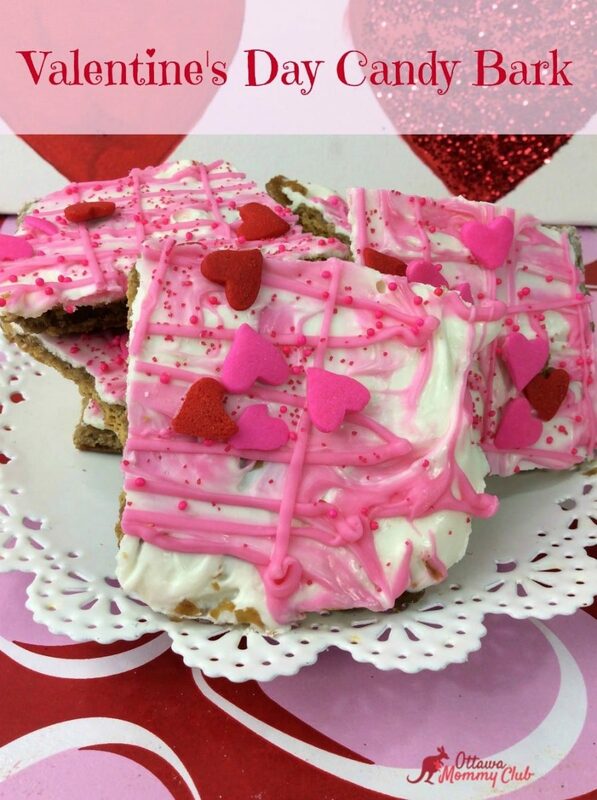 Invite Valentine’s Day Candy Bark into your home this upcoming Valentine’s Day and enjoy a simple but delectable treat that is bound to please your loved ones! Line a large baking sheet with graham crackers. Using a double boiler, melt the white chocolate and continue to stir until smooth and creamy. Pour the melted chocolate over the graham crackers. Use a spatula to spread the chocolate evenly over the crackers. Sprinkle the red and pink sprinkles onto the white chocolate covered graham crackers. Pour the red wafers into a microwave safe bowl. Microwave until melted. Follow package directions. Using a large spoon drizzle the melted red wafers over the top of the bark. Next, add the sprinkle hearts on top. Allow to set for in the refrigerator for 30 minutes. I hope you enjoyed my Valentine’s Day Candy Bark recipe! If you make it, make sure to share with us on Facebook or Twitter! Also, check out all of our other Recipes. Have to try this on valentines this year. This looks fun (and delicious!) for Valentine’s Day! I’ve never made bark before maybe it’s time I tried!